The Rexel Auto+ 100X is part of an award-winning range of automatic shredders. Simply stack up to 100 sheets, close the lid and the shredder will take care of the rest, shredding your documents into cross-cut pieces measuring 4 x 50mm. What’s more, you don’t even need to remove staples and paperclips prior to shredding as the Auto+ 100X will get through these too. The shredder shreds each sheet of paper into approximately 200 pieces and has been given a P-3 security rating. That means it is suitable for the shredding of confidential material, great for either home or office use. 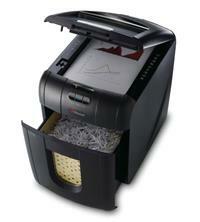 And in addition to staples and paperclips, the shredder can also shred credit cards too. Bin size is 26 litres, which will hold up to 200 shredded sheets - and the bin is a pull-out style with viewing window so you can easily see when it needs emptying. Other features include: the option to shred up to 6 sheets manually; Continuous Jam Boost Technology (whereby the shredder will automatically reverse and forward the engine three times in the event of a jam to help try and clear it); reverse option; bin full indicator to let you know when the bin needs emptying; door open, paper-jam and cool down indicators; ultra quiet operation; intelligent power save; and the option to use environmentally friendly paper bags for easy recycling. So if you’re looking for a compact, stylish shredder and want to save time by not having to feed your sheets in manually, consider the Rexel Auto+ 100X!